ooo... tonight i was going through some of my drawers and found something i would love to share. 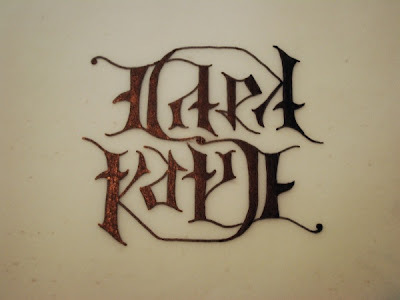 it's an ambigram i designed quite a while ago. an ambigram is a word or motif that reads exactly the same when you turn it round or flip it 180 degrees. It's gorgeous. You know what? I'm a cowrad too about tattoos. oh yes carolyn, i had lord of the rings in mind when i designed this :) as always :) yea... it would look good on something... we were actually contemplating spraying this on the bonnet of our ute :) lol! Wow Luthien, this is SOOO cool! It's beautiful, creative and mysterious all at the same time. I'm a chicken like you when it comes to tattoos but at least now it's here for you to admire all the time. I know exactly what you mean Luthien, one of those sychronistic moments in life where the universe is guiding you. The one you created is just so beautiful! OMG -- that is AMAZING! I have never seen anything like this, and you are right - this would be the PERFECT artwork to use as basis for your very first tattoo. **wink** But I won't laugh at you for being a coward. Truth be told, it took a couple of shots of tequila for me to get my first ink (hey, we were in Mexico - it seemed like a good idea), but after that I think I just very quickly got used to the needles. I think it would just be the coolest thing for you to wear this ambigram on your "body canvas", to carry your baby girl with you everywhere you go. yea... waiting for the day when i'm brave enough to do it, that would be cool! i'll probably faint in the process... lol! simon! you're such a sado!